Detached house at 20 min. From the islands Ameland and Schiermonnikoog. Romantic detached holiday home, suitable for up to 5 people, fully equipped with bathroom with steam shower cabin, 2 bedrooms, full kitchen with dishwasher and 6 burner stove. Utility room with freezer, washing machine and dryer. Room with tv / dvd / cd and wifi. Attractive and very well equipped. Separate toilet downstairs and bathroom upstairs with sink and steam shower cabin where back jets, foot massage, turkish (wet) sauna function and music. We rent 2 detached houses and 2 apartments that are close to each other. Also suitable for family groups or take Grandpa and Grandma close to the islands of Ameland and Schiermonnikoog and national park Lauwersmeer. In the nearby town of Dokkum are many shops and eateries. Dinghy and bicycles are available for rent in our B & B the breakfast. We have 4 accommodations, all our accommodations are self-sufficient and completely furnished. look at our website www. the guest room. nl for more info or call us without obligation. The availability calendar of the accommodation can be found on our website. Bike and boat rental also at the guest room. Located in the beautiful mere village Ee with the beach on the Lauwersmeer 15 minutes away. The guesthouse 4/5 people, the Terphuisje 4/5 people, apartment Vloed 4/5 persons and apartment Eb for 2 persons. In the months of July and August also a motorboat as overnight stay available for 4 people. We hebben 4 dagen tijdens Pasen verbleven. Het huisje is geschikt voor 4 personen en is van alle gemakken voorzien. Vanuit Ee zijn we dagtochtjes naar Dokkum, Schiermonnikoog en Lauwersmeer geweest. Super schönes, sauberes und liebe- und stilvoll eingerichtetes Haus. Vielen dank und Gruße von uns! Wir hoffen Sie wieder zu sehen. Mit Freundliche Gruße Laura und Adrie. Ein sehr schönes Ferienhaus, welches sehr geschmackvoll eingerichtet ist und in einem kleinen netten Örtchen liegt. Einfache Buchung, problemlose Kommunikation mit nettem Vermieter, super Haus für zwei Personen völlig in Ordnung, alles sauber und ordentlich mit Liebe zum Detail, sehr zu empfehlen. Ein Ort dem Alltagsstress zu entfliehen und zu entspannen. Sehr freundlich und familiär. Auch die Möglichkeiten der Freizeitgestaltung sind vielfältig. Besonders die Fahrt mit der Schaluppe zählen zu den Highlights. Vacanza ad Ee, in Frisia Olanda. A distanza di un mese devo dire che la vacanza in Frisia è stata davvero indimenticabile e la nostra permanenza nel piccolo paese di Ee, a casa della Signora Adrie Huisman, è stata rilassante e gradevole al di là di ogni aspettativa. Ottimo campo base per le nostre escursioni e, al ritorno, raffinata, elegante ed accogliente dimora per sentirsi completamente a proprio agio. E' stato magico e sembrava di vivere in un telefilm di "Barnaby" ! Grazie ancora di tutto, Adrie. Un caro saluto anche da mia moglie Elisabetta e dalle nostre tre nipotine. Wunderschönes Haus mit viel Liebe zum Detail ! Vielen Dank für eine wunderschöne Woche im Gästehaus. Wir wurden ganz herzlich von den Gastgebern mit Apfelkuchen und Kaffee begrüßt. Das Haus erinnert an ein englisches Cottage, welches mit viel Liebe zum Detail und sehr gemütlich eingerichtet ist. Die Familie Huisman verleiht günstig Fahrräder und ein kleines Boot mit dem es sich lohnt in das kleine Städtchen Dokkum zu schippern um gemütlich in eine der zahlreichen Restaurants einzukehren oder durch die Stadt zu bummeln. Ganz besonders toll ist, dass man auf Wunsch mit frischem Fisch vom Markt versorgt wird. Wir haben uns sehr wohl gefühlt und können dieses Feriendomizil nur empfehlen. Fully furnished detached house suitable for up to 5 people with lots of luxury. The guest house was newly built 10 years ago in an old style with a rustic interior. In the village there is a snack bar and in the nearby Dokkum there are many shops and restaurants. We rent 2 detached houses and 2 apartments, all self-sufficient. Also bicycle and boat rental. Visit our website at www. degastenkamer. com for more information, rates and availability or call us for further information. The Wadden Islands [20 minutes] from Ee are very popular for a day trip. The crossing over the Wadden Sea to both islands is 45 minutes and with a bit of luck the seals swim with you. Ameland and Schiermonnikoog are ideal for a day out for cycling, watching the beach and seals. Very popular with birdwatchers and nature walks. In the villages on the island is lovely to equip a terrace and enjoy culinary in many restaurants. On a bike along a beautiful route along the water to Dokkum where many eateries, cafes, shops and attractions are. This historic city is a city walks on the fortress well worth it. Dokkum its fine museums and a canal cruise is a must. Also great to explore by canoe. From Ee Beach Lauwersoog and Oostmahorn ideal to go with children. Lauwersmeer is ideal for swimming, surfing, sailing or motor boat hire, but fishing is also possible. On the other side of the dike [the Wadden Sea] kite surfing is done. In the harbor of Lauwersoog the fish is brought in by local fishermen and guests can enjoy a delicious fresh fish meal for little money. Around the village of Ee there are several small villages and cities to visit, of course the Elfstedentocht is very popular. By car you can visit the 11 Frisian cities that each have a unique character, with historic buildings and canals. In these cities are numerous to visit famous museums and popular tourist attractions. and aqua zoo park nearby. is very popular with children to make a small wading with a guide so as to experience nature on the mudflats and small shellfish e. d. to search. Possibly followed by horse and cart to make a tour and afterwards to make it into a delicious meal with guidance. But for adults, there are several organized by foot. Ee is halfway between Groningen and Leeuwarden and both at a distance of 30 minutes drive. Ideal for shoppers, these cities have a variety of unique shops and beautiful markets. Museums, exhibitions and art exhibitions are also well represented. Also for the outgoing public cinemas, concert halls and theater. Nearby airport is Eelde [45 minutes] and Schiphol Amsterdam [2 hour drive] where public transport to the north is well regulated. By train to Leeuwarden and Buitenpost and then another 15 minutes by bus. Completely romantic furnished detached house suitable for up to 5 people and very cozy. The terphuisje is in the middle of our village in a quiet location with the playground for children around the corner. Because there is only local traffic is very child-friendly. 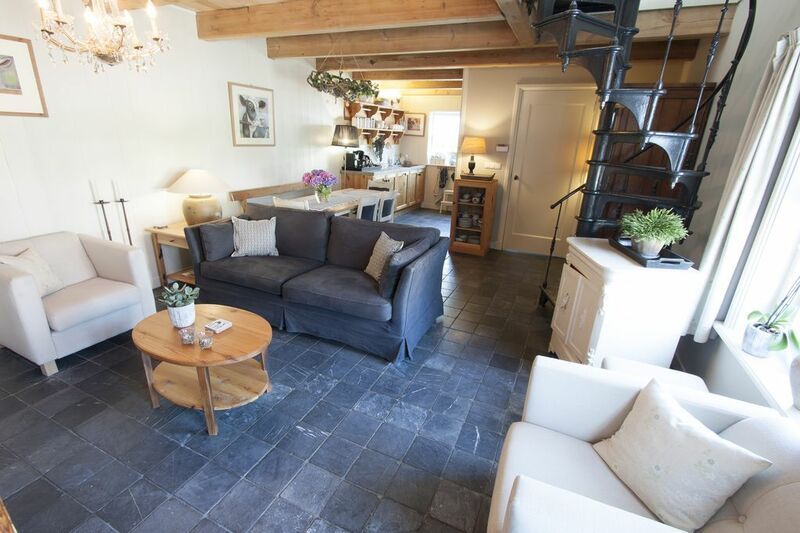 For those who have difficulty with climbing stairs, this cottage is ideal because the bathroom, the toilet and the double bedroom are downstairs. In the village there is a snack bar and in the nearby Dokkum there are many shops and restaurants. We rent 2 detached houses and 2 apartments, all self-sufficient. Also bicycle and boat rental. Check our website from www. the guest room. nl for more info, rates and availability or call us for free information. The rates always include: wifi, tourist tax, bed / bath / kitchen linen, gas / water / electricity, basic items in the house and wood for the wood stove.